Here you can read the latest updated version of the Laws which were last modified at the 129th Annual General Meeting of the International Football Association Board (IFAB) in Belfast (Northern Ireland) on 28 February 2015. These came into force on 1 June 2015. 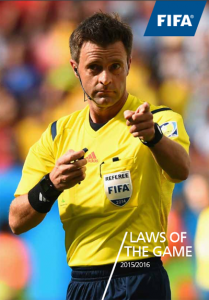 A PDF file of the complete Laws of the Game 2014-2015 is available for download here or else in the Section dedicated to Laws of the Game.